I’ve been a fan of hot corners on OS X since I switched to a Mac in 2006. On the top left, I have Mission Control, Notification Center on the top right, Desktop on the bottom right and on the bottom left, you’ll activate OS X’s legacy Dashboard view. Yep, the one with the widgets. Some people have been declaring the Dashboard’s demise for quite some time now. While people are celebrating its evolution to the notification center, some are shocked to learn that it still shipped with the latest version of OS X with no new features or improvements whatsoever. While OS X has transitioned to a flat aesthetic, the Dashboard seems to hang on to its Skeumorphic UI. Not even Apple could be bothered to change it. And oh, have you seen the Throwback Thursday feel of Dashboard website? Is this the equivalent of an OS appendix? Well I’m quite happy with my appendix thank you very much. Despite the obvious lack of support, I still find myself using the dashboard only because I’ve built certain habits around it through the years. It’s just easier to browse stocks and foreign exchange rates, use the calculator and view my the world clock instead of scrolling down notification center. I still see no reason to decommission my Dashboard. It has served me well. 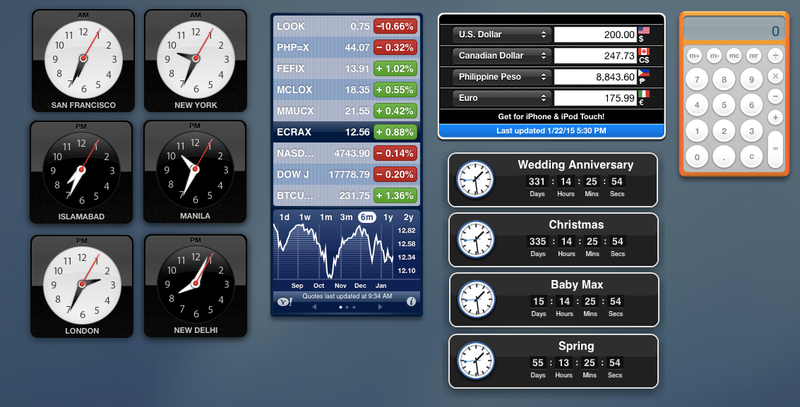 The fact that Dashboards have a full screen view dedicated to it means that you can focus on each and every widget. It’s just a shame that we’re not seeing new widgets for stubborn ones like me. Maybe it’s time to develop meaningful experiences again on the dashboard?